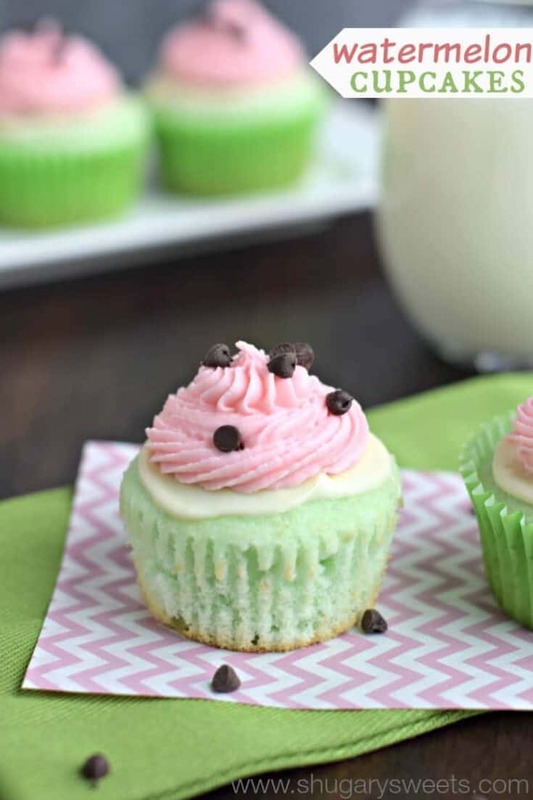 These sweet and festive Watermelon Cupcakes are the perfect summer recipe! Easy to make and delicious too! One of our favorite things we enjoy in summer is watermelon. We eat a whole melon every week in the summer, not even exaggerating. . Actually, I cut a melon in the morning and it’s gone by bedtime, but I don’t buy another one for a week, or at least until my next shopping trip. Even our dogs get in on the summer watermelon eating fun! 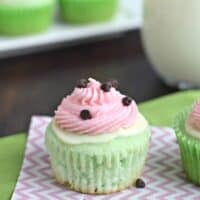 To tie us over until our next shopping trip, I whipped up a batch of these super cute and fun Watermelon themed cupcakes! Nobody has to know they start from a cake mix…and the flavor is so wonderful, even the adults will enjoy this festive treat! Now that the kids are out of school for break, I think it’s time to celebrate with a batch of these cuties! For the cupcake, add cake mix, lime gelatin, egg whites, oil and water in a mixing bowl. Beat 2 minutes until blended. Fill cupcake liners 2/3 full and bake in a 350 degree oven for 15-18 minutes. Do not overbake. Allow to cool completely. When cooled, spread melted white chocolate over top of each cupcake. While that sets, begin your frosting. In a mixer, beat butter with powdered sugar, Koolaid mix and milk. Beat for about 3-5 minutes until fluffy and smooth. Using a decorator bag and tip (I used 6S), pipe frosting on each cupcake and immediately sprinkle with chocolate chips. ENJOY! I really wanted to use watermelon juice for the frosting, but the flavor didn’t burst enough for me! So instead I used 1/2 tsp of watermelon-cherry Koolaid mix. If you can’t find the koolaid mix, you can order watermelon flavoring on Amazon! I must say, these tasted perfect. The lime flavored cupcake was so slight, but just enough to give a good base flavor. The melted white chocolate hardened and gives a little texture to your bite. I loved these. 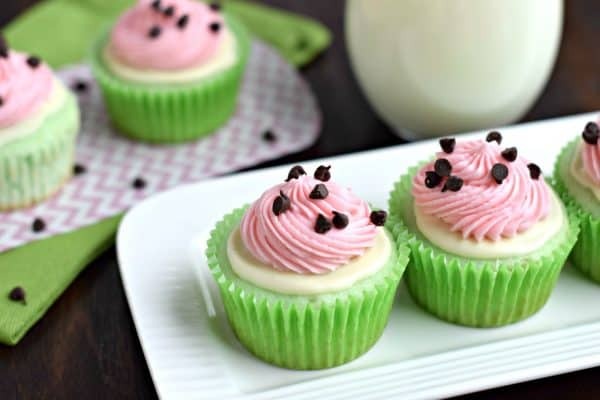 Delicious Pink Lemonade Cupcakes. Refreshing and tasty, everyone will enjoy! Bright, fresh and just in time for summer, these easy Watermelon Doughnuts from Princess Pinky Girl are every bit as tasty as they are cute! The perfect dessert for a BBQ or your next summer get-together! This No-Bake Strawberry Cheesecake Dessert from Fifteen Spatulas has layers of buttery graham cracker crumbs, fresh macerated strawberries, and a creamy cheesecake filling. For the cake, add cake mix, jello, egg whites, oil and water in a mixing bowl. Beat 2 minutes until blended. Fill cupcake liners 2/3 full and bake in a 350 degree oven for 15-18 minutes. Do not overbake. Allow to cool completely. In mixer, beat butter with powdered sugar, Koolaid mix and milk. Beat for about 3-5 minutes until fluffy and smooth. Using a decorator bag and tip (I used 6S), pipe frosting on each cupcake and immediately sprinkle with chocolate chips. ENJOY! 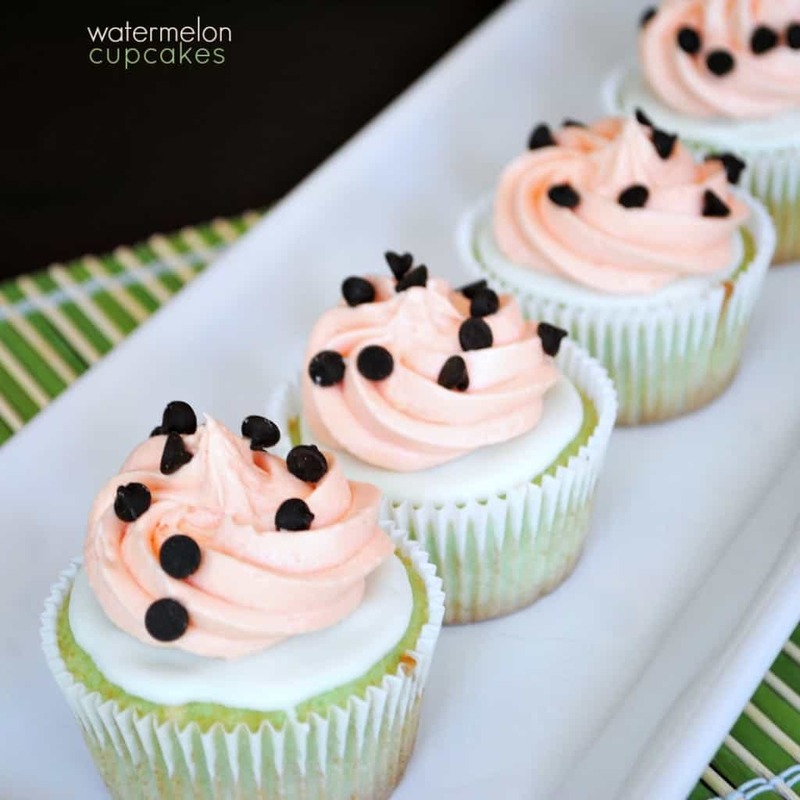 **Today’s Watermelon Cupcake recipe was originally published on Shugary Sweets on June 24, 2012 and was photographed again May 2015. This recipe has been republished in May 2018. Thanks Holly! 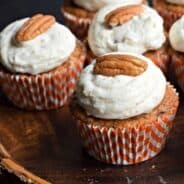 They are the perfect summer cupcake! How adorable are these? I bet these would get my kid to eat watermelon, ha. Such a great idea Aimee! Too cute and great idea with the watermelon-cherry Koolaid mix – now THAT will make the flavor pop! So fun! 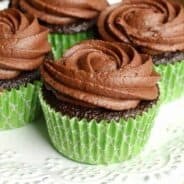 My girls will love these cupcakes! Thank you for sharing, Aimee! Thanks for stopping by! 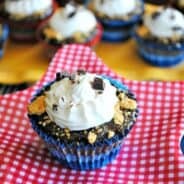 My kids devoured these (and I did too)! These look absolutely superb and i bet they are very refreshing. Going to give these a try at the weekend. I LOVE these! These are adorable. 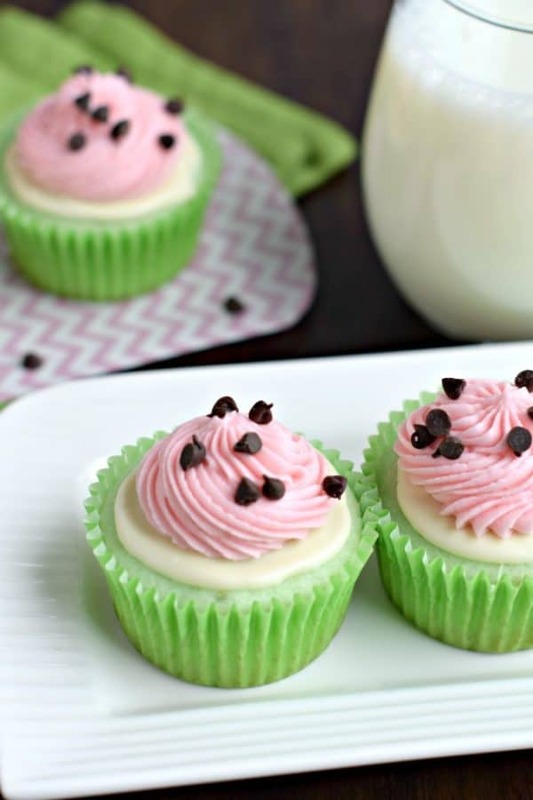 We love watermelon, it’s just what you eat in the summer, these cupcakes are perfect. I love Kings Island! Lots of memories there. I actually live “just down the road” in Batavia. Hope to get up to the waterpark this summer! These look darling, I might have to try them for the fourth of July! Glad to make you smile Julie! I love the chocolate chips standing in for watermelon seeds! SO creative. Can’t be responsible for that one, I’ve seen it before. Most times it’s been inside a strawberry cake decorated with green frosting. I just went the other way around! These look delicious! I will for sure be making these this summer! Thanks for recipe! ok – these are too cute! I will Definitely! be making these!! These are so cute and delicious looking! If I ever throw a watermelon themed party, I would make these. Hope you have a great week! Come visit me and enter my giveaway going on. Amazing presentation! I love the icing! So cute! Sounds like a great taste combo! These would be perfect for a backyard barbeque! They looked so yummy. Just so you know, I featured you on today’s Show Off Saturday. I’ve seen those watermelon nails. Send me a link if you do it!! Amiee, I just love the look of these little cuties! Lark, thanks for stopping by, hope you and your daughter enjoy them! why do you use only the egg whites? why do you only use the egg whites? By leaving the egg yolks out, the color of the cupcakes is much more vibrant! sorry for all these questions but how should I melt the chocolate? Curious….why can’t you use the sugar free lime jello? Could you use lime juice instead as well and maybe a drop of green food color? I have to watch the sugar in foods. Love these! How adorable! I am thinking of giving these a try for Fourth of July!! How cute are these!!! I Love it!